I don’t always cook the healthiest of meals….SHOCKER!! Right? If you’ve been following along here for any amount of time, you’ve probably figured that out by now. Well, I’ve decided that I am going to try and incorporate more healthy food in my diet. That doesn’t mean that I’m not going to indulge myself in some “sinfully good, but oh so bad food” every once in a while, so you can keep coming here and expect to find that. But don’t be surprised to see some healthier alternatives as well. I guess you could say I took a page from The Mom Chef at Taking on Magazines. She does what she calls a Turn Back Time Tuesday where she pulls out old magazines and finds an old recipe. Except this isn’t Tuesday. And I don’t keep magazines. What I do (or used to do, haven’t done it in a while) is rip out recipes that I think are interesting and stick them in a binder with high hopes that someday I’ll cook them (most of the time I never do). Anyway, I wanted to find a healthy meal to cook and I remembered that forgotten binder and I knew it must have something in it. So after digging around in the study (that still has not been fully unpacked after 8 months), I found it. Flipping through it, I came across this recipe from Cooking Light Sept 2009. Better late than never, right? And the best part…..its a five ingredient meal! As always, I have to do things my own way, but for once, I feel I pretty much stuck to the recipe. One thing that just seemed wrong to me about this recipe is that they want you to grill the salmon first, then grill your veggies, chop them up and make the salsa. To me that just seemed wrong. The salmon would get cold while taking care of the salsa. And to me, warm salsa on cold salmon did not sound appealing. But cool (or at least room temp) salsa on top of hot salmon….now that holds more appeal. Sprinkle fillets with salt and pepper. Grill for 4 minutes per side or until desired degree of doneness. 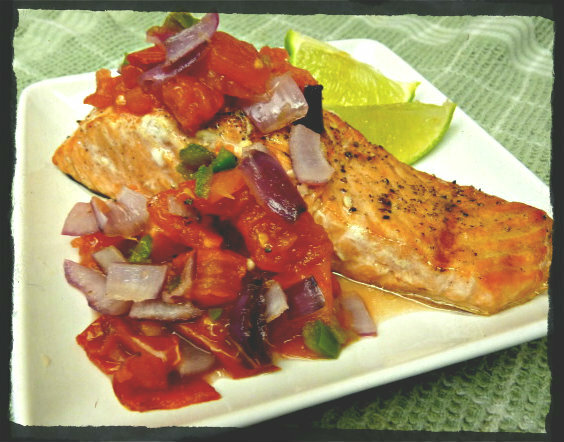 While resting salmon under foil, coarsely chop tomatoes and onion. Finely chop jalapeno, for a mild salsa, remove seeds first. 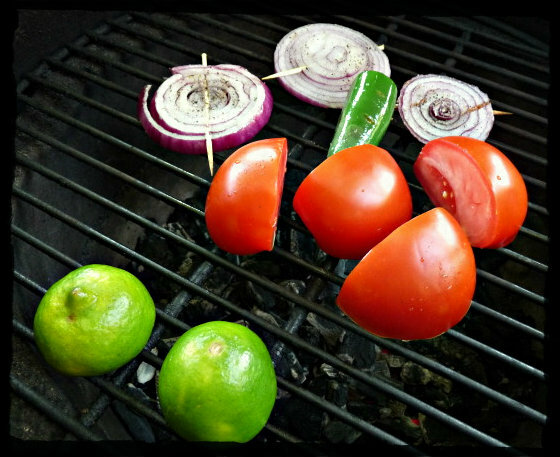 Combine tomatoes, onion, jalapeno, 1/4 tsp salt, 1/4 tsp pepper and juice from 1/2 lime. Taste and adjust seasonings. The recipe, coming from a magazine focused on healthy food and not grilling, obviously does not take smoke into consideration in its recipe. 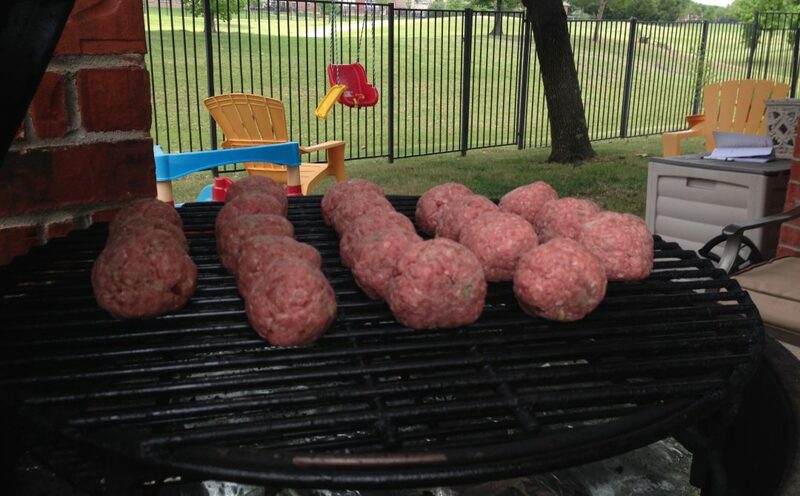 Lets face it, most people who attempt this recipe will probably use a gas grill. (and there’s nothing wrong with gas, although I personally believe gas goes in a car, not in a grill. 😉 ) I decided to use apple wood for this recipe, but any light wood, especially a fruit wood like apple, cherry or peach, would work well here. And yes, you can use wood chips on a gas grill. Just wrap them in foil and poke a few holes in it to allow smoke to escape. I’m usually wary about healthy recipes. Often times, they sacrifice flavor in order to be healthy. But that was not the case here. 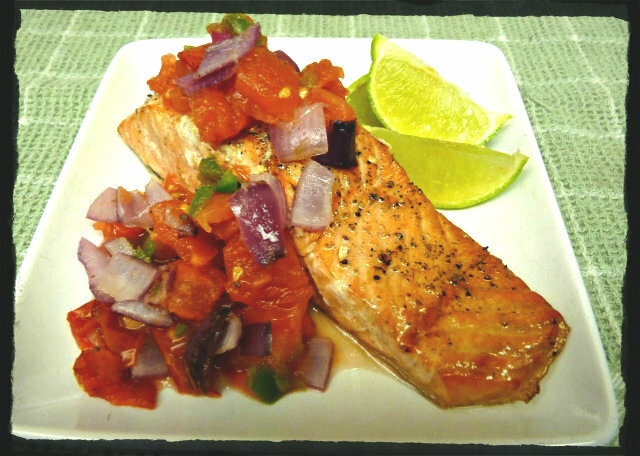 Although the salmon was only flavored with salt and pepper, the salsa more than made up for it with the sweetness of the grilled onions, the acidity from the lime and the heat from the jalapeno. 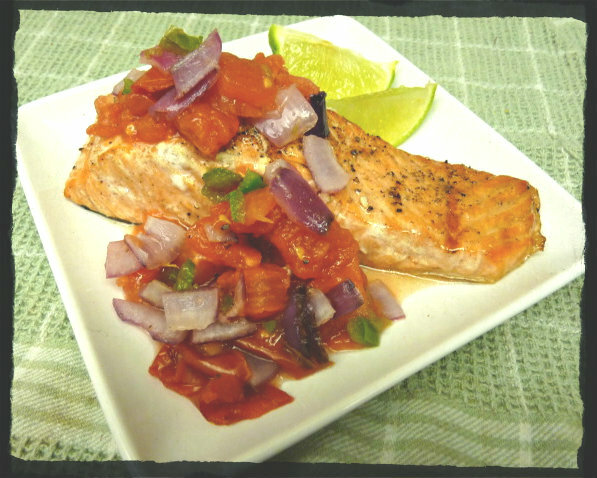 I also wasn’t real sure about using salmon with salsa, but it paired nicely and salmon is a great fish to grill (I’m sure other types of fish would work well in this recipe) If you are looking for a healthy seafood dish that packs a ton of flavor, this just might be the recipe for you. One last picture cuz I’m super happy about the way they turned out. Well shucks, thank you for mentioning me. Look at you, grabbing old food magazines off the shelf. Cooking Light, no less. I’m impressed. I’m even more impressed by how the salmon and salsa turned out. I love the color on the fish. Wow. I agree that grilling the fish before the salsa makes no sense. It looks absolutely delicious. I guess this could be a Way Back Wednesday, lol. I used to have a subscription to Cooking Light, now I just steal my Mom’s when she is done with it. And there are a couple of recipes that I’ve wanted to try lately from Mrs. G’s Southern Living. This is a really nice idea! I loooove grilled salmon, and the salsa on it looks so delicious!!! It really was, Bonnie. 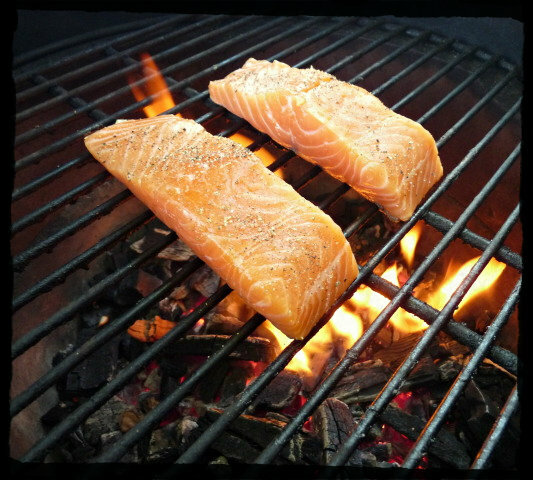 Brought a whole new element to grilled salmon. Nice recipe and from looking at your photos, I’m sure it is delicious. 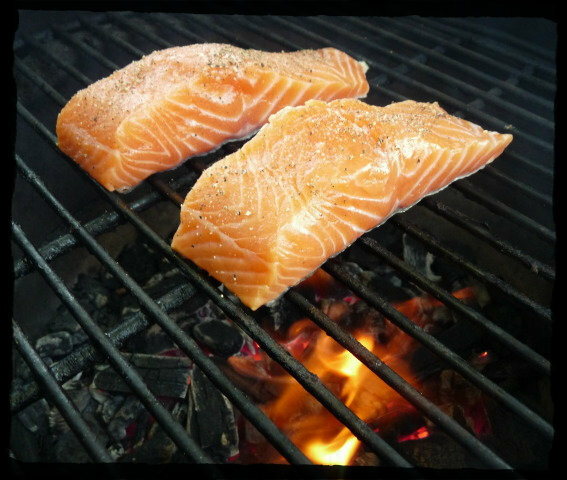 I always cook on a gas grill and have good results with salmon. I have an apple orchard so I have access to all the apple wood you could dream of. It really was tasty, Karen. Nothing wrong with gas, I’ve had a few gas grills over the years. Easy and quick to operate. Jealous of all the apple wood you have. Do you ever use it when you grill? I have used it occasionally. Looks great Jason! Very nice job on the plating and photos too!!! Also, salmon is my favorite fish in the world. I could eat it every day. I think I told you about how I smoked fish once and it turned into salmon jerky. *ahem* I’m trying this one! Looks delish! Thanks, Jen. I was getting a bit bored of the old look. Thought I’d try something new. Not sure if I’m gonna stick with it or not. Yes, you did tell me about your salmon jerky. No chance of that happening with this recipe. Just a quick grill, about 4 minutes per side. Super tasty for being so simple and healthy. I have a hard time doing anything different with salmon for two reasons. First, I hate fish and don’t eat it. Second, the family is so stuck on having it done either with my potlatch seasoning or Dizzy Pig’s Raging River that I always do it the same way. I need to shake it up some like this. It’s hard to go wrong with the Ragin’ River. That is one of our favorties on salmon, but I’ve been looking for ways to shake it up a bit. What is your potlach seasoning?